I was invited to a media preview in order to write this post. All opinions are my own. Frankenstein’s laboratory where you’re sure to spark amazement with his new Van de Graaff generator! A station where you get to make your very own slime. The Monster Academy Talent Show where each “monster” will showcase their hidden science talents! All of the “Spooky Science” activities will be available through October 31 and are included in the price of regular admission. For more information or to purchase your tickets online, please visit http://www.discoverycube.org. 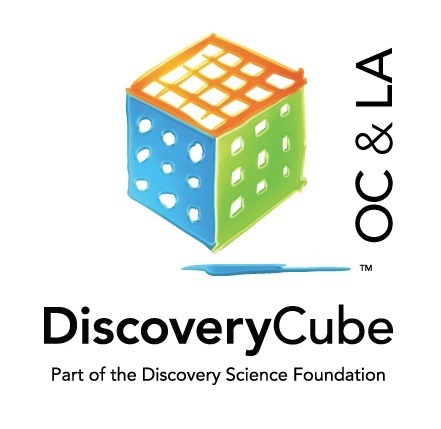 Connect with Discovery Cube OC on Facebook, Twitter, and Instagram. Logo is property of Discovery Cube OC and used with permission. Parenting OC magazine has partnered with Discovery Cube in Santa Ana to present the 10th Anniversary Edition of the Kids’ Summer Opportunities Jamboree! The event will take place on Saturday, March 5, 2016 from 10 a.m. to 3:00 p.m. at the iconic Orange County family destination and is free to attend. Discovery Cube, which expanded this past summer and doubled in size, adding the 10,000 square-foot Julianne Argyros Showcase Theater and other attractions, is the leading hands-on science center for families in Southern California. The winner in each category will be photographed at the event by internationally-celebrated cover photographer, Ana Brandt. Each winner will be featured on the cover of the magazine, which has won national awards for its covers. All nominees are photographed at the event, and will receive a keepsake cover just for entering. The Extreme Game Truck – In the parking lot, gamers can show their X-Box and Playstation skills in the Extreme Game Truck, a hybrid luxury limo-semi with mood lighting effects in the ceiling, 6 55-inch screens, surround sound and every major gaming console known to little mankind. The family scavenger hunt – There’ll be $3500 in prizes available to win by those who successfully complete the family scavenger hunt. Prizes include a week of summer camp (Camp James, Camp Galileo, Irvine Slammers Soccer), an OCSA class, $1,000 toward Smile Wide orthodontia and a two-year family pass to Discovery Cube. This event will be held on the exhibit floor. Afterwards, families can head off for even more fun at the Cube. Free passes will be available to all children, ages 3 to 14, for admittance on the day of the Jamboree event. (Child must be accompanied by an adult.) The tickets (each valued at $12.95) can be downloaded from http://www.parentingoc.com. The Discovery Cube is located at 2500 N. Main St., Santa Ana, CA, 92705. For more information, please visit http://www.parentingoc.com, or call 714-630-4510 x 6. This is not a sponsored post. All opinions are 100% my own. Images and logos are property of Discovery Cube and Parenting OC. Discovery Cube Orange County’s most POPular event, Bubblefest, returns to the Cube March 28 through April 12, 2015. The annual festival will include the fan favorite Mega Bubblefest Laser Show, featuring star performer Deni Yang. The family event will feature some of the best food trucks in Orange County, too! Along with the featured Mega Bubblefest Laser Show, the outdoor festival will also offer hands-on exhibits and experiments to demonstrate science concepts on surface tension, elasticity, air pressure, friction and energy. These science concepts are brought to life through hands-on, soapy fun for children and parents of all ages. Guests will also enjoy a fun inflatable play zone with slides and obstacle courses. Special to this year’s festival is the grand opening of the $1.5 million Julianne Argyros Showcase Theater, which was generously funded by the Argyros Family Foundation. The 10,000 square-foot flexible space is a first-of-its-kind in the museum world with the ability to transform from a world-class exhibit hall to a 500 seat theater. Inside the Julianne Argyros Showcase Theater, bubble fanatics will witness Bubble Scientist Deni Yang perform his signature bubble artistry and stunts with bubbles, smoke, lasers, and a few young volunteers from the audience. His repertoire of tricks include a bubble carousel, smoking bubbles, bubbles within bubbles, and many more. Yang has been demonstrating bubble art with his family since childhood. Through his career, he has earned international acclaim and the Guinness World Record for producing the largest bubble ever, measuring over 170 feet. The Julianne Argyros Showcase Theater is a stunning climate-controlled venue, with innovative flex-space design. Designed by nationally renowned architects John Sergio Fisher & Associates, this exceptional visual and technical facility will feature digital surround-sound and state-of-the-art lighting. The Julianne Argyros Showcase Theater will serve nearly one million visitors annually and host special events, galas, lectures, science fairs and other fun community events throughout the year. To top off a day bursting with fun, guests visiting Bubblefest will also get to experience LEGO Travel Adventure and National Geographic Presents Earth Explorers. 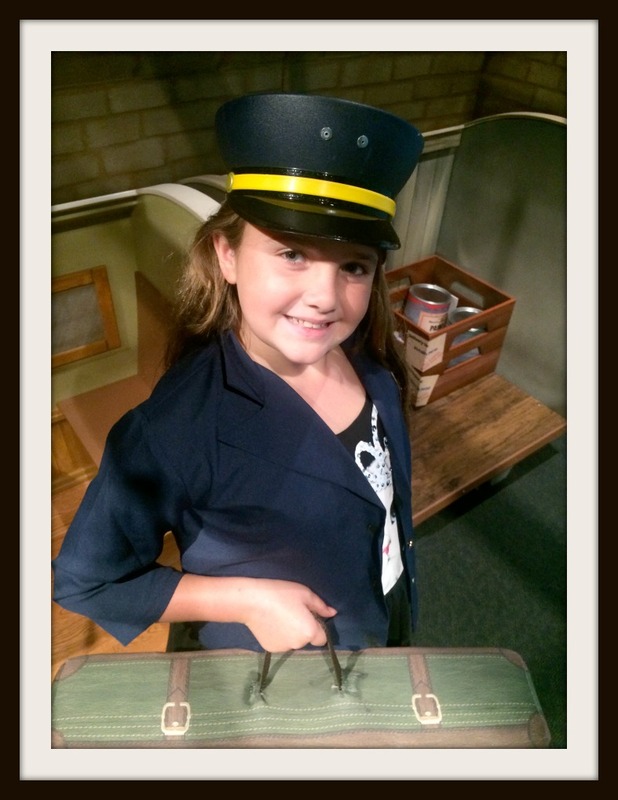 These two exhibits bring to life travel and adventure across the globe through interactive set pieces and exhibits. Bubblefest XIX, which includes the Mega Bubblefest Laser Show, Water Spheres, and all outdoor activities are an additional charge of $5 for members and $7 for non-members on top of general admission to Discovery Cube Orange County. Tickets can be bought online at http://www.discoverycube.org or on campus at Discovery Cube OC. General admission prices are as follows: adult ($16.95), senior ($12.95), and children 3-14 ($12.95). During Bubblefest, Discovery Cube OC will have extended hours from 9:00 a.m. to 6:00 p.m. Discovery Cube OC is located at 2500 North Main Street, Santa Ana, California 92705. Aspiring engineers are invited to learn and experiment at Discovery Cube Orange County and Discovery Cube Los Angeles between February 21 and March 1, 2015. The Cube is celebrating National Engineer’s Week with a lineup of friendly competitions, hands-on activities, and a special guest speaker from NASA to engage young minds in the fields of science, technology, engineering, and math (STEM). The week begins on Saturday, February 21 with hands-on activities that allow guests to put their engineering talents to the test. Guests will experiment and compete for prizes in daily parachute drops, learn about physics, electrical engineering, and participate in the annual Egg Drop Competition during this week-long workshop. Snap Circuit Building: Interactive electrical engineering table top that teaches about series and parallel circuits. Forces & Motion Stage Show: A game show style presentation teaches guests about the basic physics of forces and motion in a simplified demonstration relating to Newton’s First Law of Motion. Guests are also invited to join the annual Egg Drop Competition and enjoy a special presentation by NASA Ambassador, Richard Stember, on Saturday, February 28 at Discovery Cube OC and Sunday, March 1 at Discovery Cube LA. Guests who participate in the thrilling Egg Drop Competition must create an “ETV” (egg transport vehicle) to protect an egg as it drops 20 feet to the ground. Prizes will be awarded to the builders of the three devices with the lightest weight, least amount of materials, and a surviving egg. Doors open to the public February 21, and Engineer’s Week is included in general admission to Discovery Cube OC and Discovery Cube LA. Tickets can be bought at Discovery Cube or online at http://www.discoverycube.org. Prices are as follows: adult ($16.95), senior ($12.95), and children 3-14 ($12.95). Discovery Cube OC and Discovery Cube LA are open daily from 10 a.m. to 5 p.m. Currently, Discovery Cube LA has a special admission price of $10.00 for any guest. LEGO® Travel Adventure and National Geographic Presents: Earth Explorers Traveling Exhibits Open at Discovery Cube OC on January 17! Get ready for the ultimate adventure with LEGO® Travel Adventure and National Geographic Presents: Earth Explorers opening at Discovery Cube Orange County on January 17, 2015. Adventurers of all ages will enjoy this interactive journey as they build a transportation vehicle out of LEGOs and explore Earth’s most extreme eco-zones in Earth Explorers. In Lego Travel Adventure, young creators will create vehicles of all shapes and sizes that will drive, fly, or float through exotic terrains. Suit-up as a pilot, ship captain, or racecar driver to find inspiration for your vehicle or check-out a display of vehicles made from LEGO bricks, including: a spaceship, boat, motorcycle, and more. Build a vehicle with pieces from popular LEGO sets, take a photo with a kid-sized racecar made from LEGO® Duplo® blocks, and take the “Travel Challenge” to build a virtual LEGO vehicle that will travel through lava, swamps, rivers, and oceans. LEGO Travel Adventure also features creations by LEGO Master Builders including recreations of the driving of the Gold Spike in the Transcontinental Railroad, the building of the first Model T, the Wright Brothers flight at Kitty Hawk, and an ocean liner. The exhibit also features a diorama of the Travel Adventure Vehicle (TAV) – a vehicle designed to travel across land, water, and through the air. Age-appropriate build tables featuring parts and pieces from popular LEGO sets are available in the exhibit for children to create their own vehicles. Visitors are also invited to take photos of their exhibit creations to email to their friends. The adventure continues as guests explore some of the wildest places on the planet in National Geographic Presents: Earth Explorers. Follow some of National Geographic’s explorers through this family-friendly exhibit to research some of the most extreme eco-zones on earth including polar regions, oceans, mountains and caves, rain forests, and the African Savanna. Adventurers will discover new species, study animal behavior, and learn how technology plays an important role in the exciting discoveries. Explorers will also test their ability to live in an ice-covered world while exploring an arctic cabin, dive into the ocean with a 3-D submersible to learn about life forms living deep beneath the surface, and identify insects from the Amazon while trekking through the largest rainforest in the world during this interactive exhibit. Each of the six areas in Earth Explorers feature a unique interactive digital experience that utilizes an advanced technology to bring animals inside the exhibit to life. Doors open to the public on January 17, 2015. 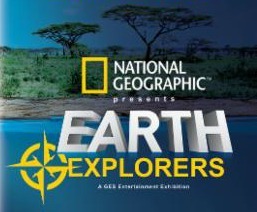 LEGO Travel Adventure and National Geographic Presents: Earth Explorers are both included in general admission fees. Tickets can be purchased at Discovery Cube OC or online at http://www.discoverycube.org/oc/. General admissions prices are as follows: adult ($16.95), senior ($12.95), and children ages 3-14 ($12.95). 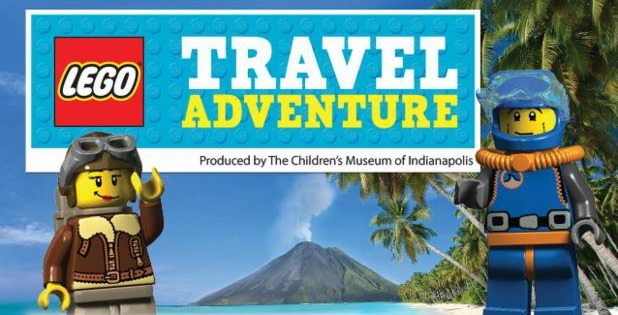 LEGO Travel Adventure is the second in a series of traveling exhibits to be produced by The Children’s Museum of Indianapolis in conjunction with LEGO Systems, Inc. The previous exhibit, LEGO® Castle Adventure debuted at The Children’s’ Museum of Indianapolis in 2009, and will travel to museums and science centers throughout the United States for a five year period. Additional LEGO exhibits are planned for the future. This is not a sponsored post. I was provided with images and information about these amazing exhibits to share with my readers. 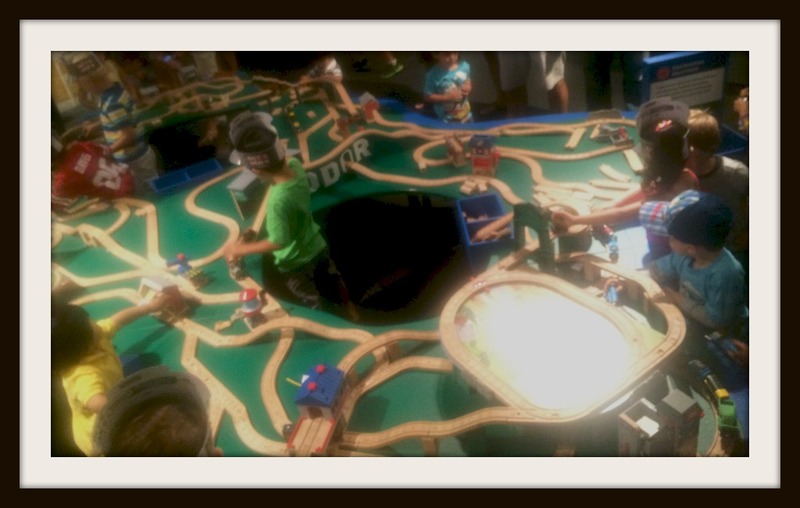 Thomas & Friends: Explore the Rails Exhibit Now Through January 4 at The Discovery Cube OC! Emi and I had the privilege of attending a special preview of the Thomas & Friends: Explore the Rails exhibit at The Discovery Cube OC. It was the opening weekend of the exhibit and and there were so many excited little boys and girls who came out to play! It’s such an adorable, hands-on exhibit, sponsored by Fisher Price. We love Thomas! He’s everyone’s favorite blue engine! My daughter, now 9 years old, watched Thomas the Train when she was younger. She was always fascinated by the way that their faces moved and talked in the shows. She still knows all of the trains’ names. There’s even a train named “Emily”. I didn’t even realize that. She actually told me. Thomas & Friends! How many of them can YOU name? The exhibit will take you on an imaginary trip to the Island of Sodor. 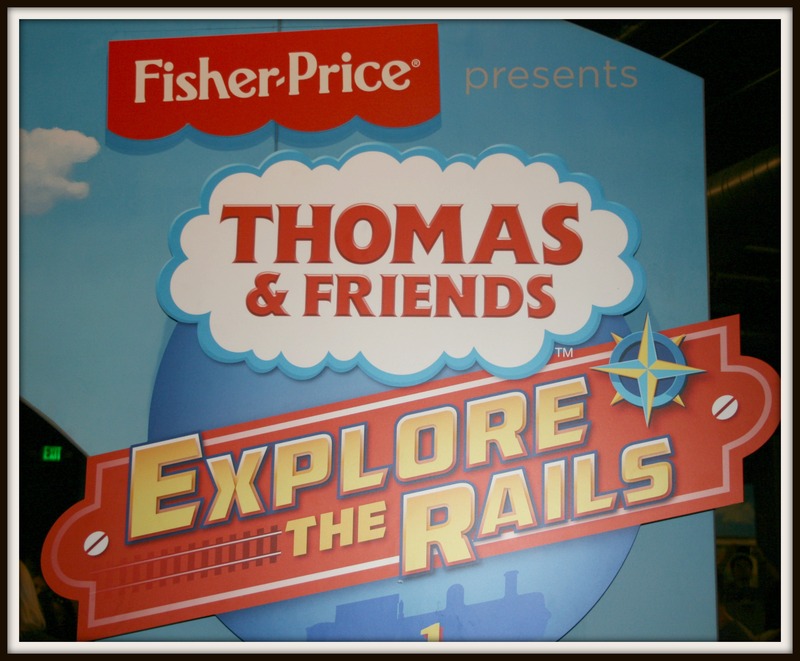 Thomas & Friends: Explore the Rails is a hands-on STEM exhibit, based on the adventures of Thomas, his engine friends and the Island of Sodor’s iconic locations: Knapford Station, Sodor Steamworks and much more. Visitors can help Thomas and his friends solve a variety of challenges, from simple sorting and shape identification to more complex engineering obstacles. There are a ton of photo opportunities! 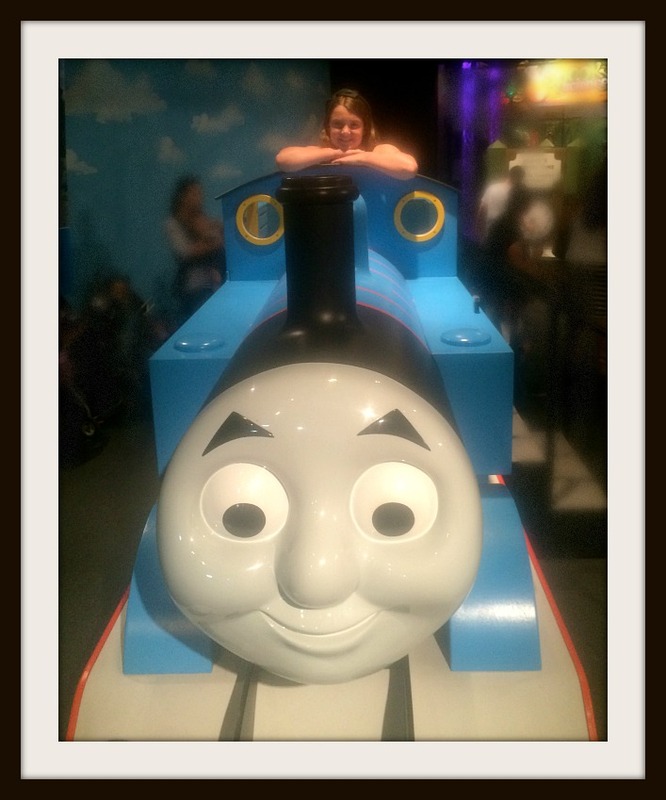 I don’t think you’re ever too old for a photo with Thomas! Every child there that day must’ve flocked to the room full of train tables! So much fun with these hands-on activities! 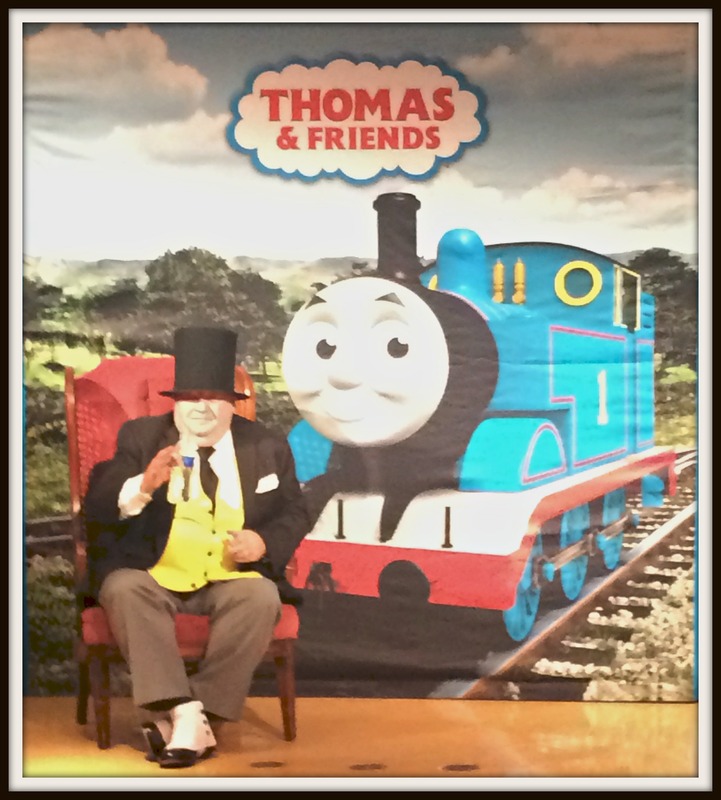 Visitors can enjoy story time and a Meet n’ Greet with Sir Topham Hat, himself! 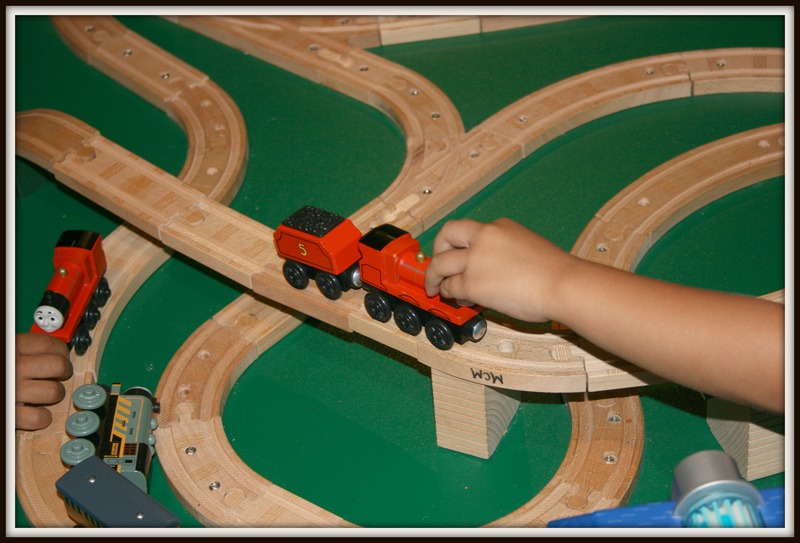 Kids can have fun playing with all of the train props that are set up. The conductor who took my luggage looked so familiar! Although the majority of the museum’s guests that morning were preschool age, Emi and I had a blast together at the Thomas & Friends: Explore the Rails exhibit! I think it’s so much fun to be able to step inside of the City of Sodor and be able to imagine that you’re part of their world! The exhibit runs through January 4th and it’s a definite must-see! For more information on The Discovery Cube OC, click here. You can also connect with them on Facebook, Twitter, & Instagram. Disclosure: I was invited to attend this event for the purpose of writing a review. No monetary compensation was received. All opinions are 100% my own.